Is online video advertising following the TV model? MediaTel tells us that forecasts suggest that total duration levels of traditional TV advertising will be transferred to digital TV viewing at some point. The 'at some point' is the cruical bit: when! Demand-side platforms have evolved tremendously but these are still the early days in the evolution of this space. The proposed EU rules suggest the creation of an online "right to be forgotten." That would impart to users the power to tell websites to permanently delete personal data. The rules also mandate that users give explicit consent before companies can use or process their personal data in any way. The 20-page document also criticizes the companies' current privacy policies as opaque. News Corp. has obtained a minority stake in Rubicon Project, a Web advertising firm, in exchange for its online ad group Fox Audience Network. It shouldn't matter what you call it, social-media or not, surely companies should know what's being said about them? Mobile data revenues in the U.S. approached $25 billion during the first half of 2010, up 27 percent in contrast with the first six months of 2009, according to new data issued by CTIA-The Wireless Association. Sky and IAB prove branding effectiveness of online video in UKâ€™s most in-depth â€˜liveâ€™ video industry study to date. New research shows that consumers want to investigate brands in their own time, and are more open to receiving ads around quality video content. And so to New York where Google predicted â€œmobile is going be the number one screen through which users engage with advertisersâ€™ digital brandsâ€ Thatâ€™s just one of the seven predictions that Googleâ€™s Neal Mohan and Barry Salzman are widely reported to have said at IABâ€™s MIXX. Take a deep breath and breathe. How do you begin this issue of â€œLast Week In Digital Advertisingâ€? Itâ€™s actually pretty hard as weâ€™ve been on the wrong end of the fire-hose of industry announcements, news and comment through almost every channel imaginable thanks to New Yorkâ€™s Advertising Week. Itâ€™s an event where everybody seems to announce something. It would have been perfectly possible to spend the entire week reading comment about the event and not doing much else. This week I learnt that Twitter generates 12 terabytes of data. AdWeek, I imagine, produces many times that. Still, it was probably worse if you were actually there, right? There was a follow-up on my mention last week of BIA/Kelsey’s research claiming that one in four local ad dollars would be spent with digital – across all digital channels – in the not too distant future. mocoNews.net reported that by 2014, U.S. mobile local ad revenues will have grown to $2.02 billion in 2014 from $213 million in 2009 (sourced from that same report). So is ‘local mobile’ where the money is? The AOP reported 60% of publishers agree that more local and ‘niche’ digital content is crucial (AOP Content & Trends Census 2010) to their success, so I guess we should stand by for launches of such content soon. Fortunately, makers of Blackberry apps, even the local ones, can now monetise their apps nice and easily through the newly announced BlackBerry Application Platform which aims to aggregate ads from mobile networks to maximise the revenue. Looks like a very nice yield management tool for mobile app makers, don’t you think? We all know mobile is going to be big. eMarketer put that into perspective last week, reporting a ComScore report (albeit from June) suggesting smartphone ownership across the big western European countries had grown 41% between 2009 and 2010, to 60.8 million subscribers. If much of that mobile advertising market is to be location-based then itâ€™s reassuring for us in the business to read that the â€œAd industry acts now to safeguard location marketingâ€ as New Media Age ran with this week. Itâ€™s really the same story Iâ€™ve been noting week-in week-out here: tell users what you are doing and given them ways to opt-out. That doesn’t have to stop you explaining the advantages of sharing data. I know, you know this. And so to New York where Google predicted â€œmobile is going be the number one screen through which users engage with advertisersâ€™ digital brandsâ€ Thatâ€™s just one of the seven predictions that Googleâ€™s Neal Mohan and Barry Salzman are widely reported to have said at IABâ€™s MIXX. You can, of course, get it from the horseâ€™s mouth on the Google Blog. Publishers will be happy to hear their prediction that the digital advertising business will grow to be a $50 billion industry in five years. Are those US-only numbers? Context people! Itâ€™s everything in a global business like weâ€™re in. Another of Gâ€™s predictions included the suggestion that 50% of campaigns will eventually include video. Video will be bought on a cost-per-view basis that Googleâ€™s been suggesting means that â€œthe user will choose whether to watch the ad or not, and the advertiser will only pay if the user watchesâ€. I get the bit about the advertiser only paying if the user watches the ad but I wonder if the â€˜choose to view an adâ€™ is sustainable. I wonder what the broadcasters think? To be fair, it could be “choose to view one of a selection of advertisements” so it makes a little more sense. If you saw their presentation at Advertising Week, drop me a note for clarity. So much video advertising is going to have an impact on broadcast television, surely. I was pointed to an article at Lucid Commerce last week thatâ€™s looking at this from the broadcast standpoint. Does television loose when a consumer takes some kind of action online because that action gets attributed to an online campaign (of course, the assumption here is that there is online activity running). The piece starts of with the assertion, â€œIn general, online advertising systems are unaware of the offline advertising that is going on around themâ€ and I think this is, generally, true but is â€“ hopefully â€“ built into the resulting research analysis. It is why I was quite interested to read a piece on MediaPost that began, â€œElectronic Arts (EA) plans to unveil Thursday a cross-platform reporting dashboardâ€ but then disappointed to see it only covered online, console, mobile, email and social. I had thought theyâ€™d solved the true cross-platform conundrum. To be fair, many companies are trying to solve the cross-platform problem and I am sure somebody will get there, eventually. Understanding how often somebody sees a message from a brand across all channels is important to enable us to really understand the impact of any marketing message, so any multi-platform reporting is to be welcomed. Direct Marketing News ran a piece titled, â€œWhy finding the optimal ad frequency is difficultâ€ that made it clear there was plenty of work to do on that front. Iâ€™ve been listening to Spoitfy while writing this piece and, really, thereâ€™s a high frequency to some ads there that â€“ for some reason â€“ seems much more annoying than high frequency rotations on broadcast radio. As an aside, I discovered last week that the IAB has a Digital Audio Committee thatâ€™s probably looking at this kind of thing as I type. I hope so. Back Googleâ€™s crystal ball. I think many of the predictions were sensible and reflective of what we are all seeing in the industry. However, the concept that by 2015 75% of ads on the web will have some kind of social element is something thatâ€™s going to take some thinking about yet. I am not disagreeing but to achieve that will take a step-shift in the use of so-called social media within all advertising. That, in turn, is something quite difficult to envisage for 2015. Talking social, I really think weâ€™re too early to truly understand the role it plays in marketing & advertising. There are lots of possibilities but we need more data and not the kind of reporting that suggests the impact of social is small (â€œTwitterâ€™s Impact On News Traffic Is Tinyâ€) without any true context. Yes, I commented on that story on the site, but itâ€™s actually not unusual. Since I began writing â€œLast Week In Digital Advertisingâ€ Iâ€™m reading an increasing number of industry articles that donâ€™t have any context in their reporting. Now, I understand sometimes this is the tease to get you to buy a research company’s report but I think the reportage needs a little more rigour. At Ad:tech London there was some discussion from the publisher side about â€˜data leakageâ€™ (which is far too complex to explain in a trivial column like this so I could mis-characterise the whole things a data theft and let people moan back at me). Good to see, then, that in New York PubMatic announced a tool allowing websites â€œto determine not only how many tracking tools the site itself is installing, but also how many tracking tools are being installed by advertisers without the websiteâ€™s knowledgeâ€. Iâ€™ll be watching that one with interest. With all this tracking, as we’ve been reading for weeks, thereâ€™s a constant stream of data being collected, analysed and stored somewhere. This caused Eric Porres at iMedia Connection to ask â€œIs audience data more valuable than advertising inventory?â€ Certainly, the data could be the most valuable asset for a lot of publishers, agencies and advertisers. OK, to end, some digital advertising facts and figures we learnt this week. Nice to hear that by 2014 nearly 42% of online ad dollars in the U.S. will be spent on branding, compared to just 35.7% today (â€œBranding Grows as Online Ad Objectiveâ€ via Reuters) but it doesnâ€™t seem like big growth to me. Also in the ‘good numbers category, I saw that, through Real Time Bidding systems you can see â€œclick-through rates improving by up to 135%, conversion rates up 150% and cost per action up 145%â€ (â€œReal Time Bidding: The Sleeper Ad Technology Growth Storyâ€ via Marketing Vox) while retargeted display ads gave a 1,046% lift in searches on brand terms within four weeks after exposure (â€œRetargeting Used by Marketers for Cost-Effective Brand Liftâ€ via eMarketer). In the UK, 38.4 million folks accessed the internet during August, according to the latest data from UKOM (â€œUKOM Data Report: August 2010â€ via MediaTel Newsline) which means there’s a lot of people out there so see this ad stuff! And so we get to the end of another week. Lots of stories not covered here, lots of companies not mentioned. 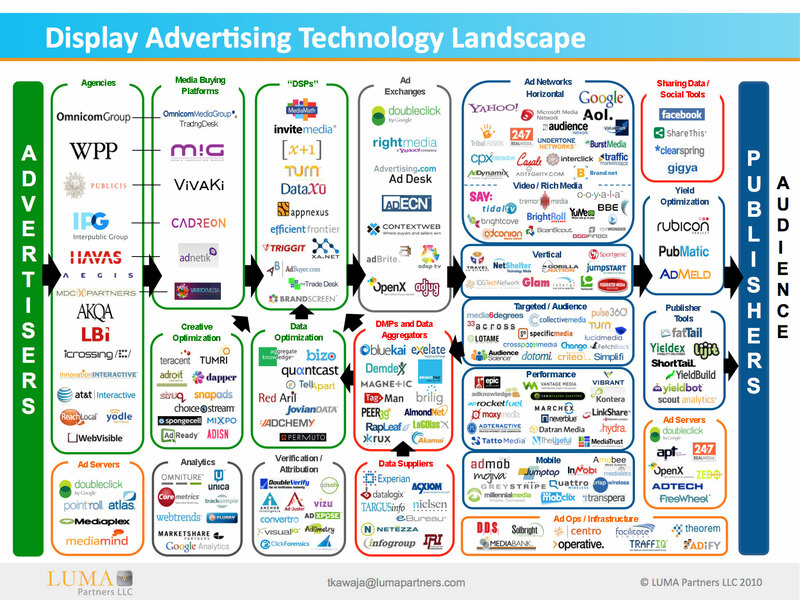 Still if you fancy trying to understand the business then thereâ€™s an updated version of the digital advertising technology landscape diagram. You can get it here. And then spend a week trying to work out how it really does all fit together before coming back to read next week’s review of this week’s advertising news.